We all know the incredible health benefits of salmon, but if you aren’t a big fan of this Omega 3 packed fish, then getting those recommended servings can be tough. I, myself, do not enjoy the fishy taste of salmon and always strive to create salmon recipes that don’t taste too, well, salmon-y. That’s why I LOVE this simple, light Lemon Garlic Salmon Recipe. It’s incredibly easy to prepare and it tastes fantastic. The lemon and garlic help eliminate most of the fishy taste, yet aren’t overpowering. 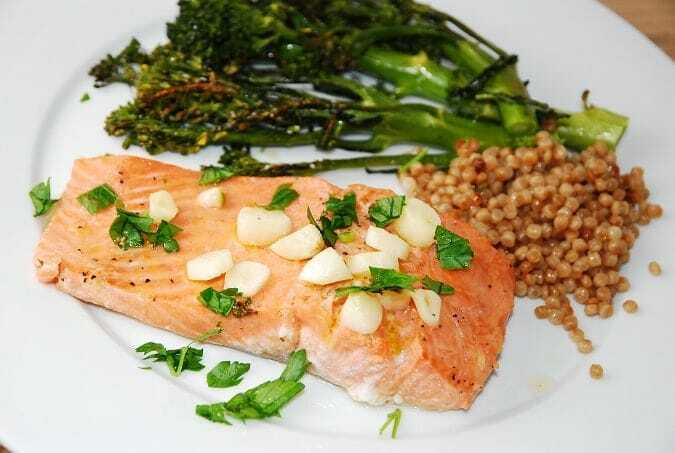 I paired this Weight Watchers salmon recipe with some roasted Broccolini and whole wheat Israeli couscous. Delicious, easy, and low in Weight Watchers Points. And if you need to make this for a larger crown, it’s really easy to double or triple the recipe. Simple, yet succulent, this tender and juicy salmon makes a wonderful Weight Watchers dinner recipe. The lemon and garlic marinade offer a wonderful flavor to the salmon without being overbearing. In a medium sized, shallow bowl, whisk together the olive oil, lemon juice and chopped garlic. Salt and pepper both sides of the salmon and place into bowl, making sure to coat all the salmon evenly with the marinade. Cover and refrigerate for 2-3 hours. Preheat broil. Line a baking sheet with foil, and lightly mist with nonfat cooking spray. Place salmon on baking sheet, and spoon remaining marinade over the top of the salmon. Broil until salmon is cooked through, flakes easily with a fork, and begins to brown on the outside, about 10 minutes.